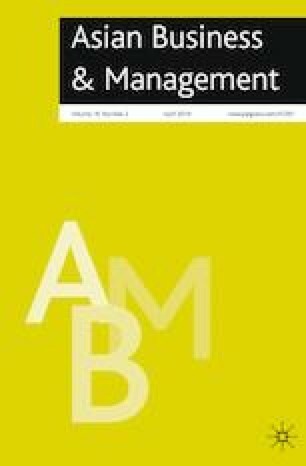 While corporate behavior is greatly influenced by the institutional environment, research on corporations’ socially unacceptable behavior in the context of Asian countries remains relatively scarce. Furthermore, how the public reacts against corporations’ bad deeds may vary across regions. Using a sample of 1023 boycott events with 93 targeted firms in Korea over the period 2006–2016, we investigate whether the public’s use of boycotts affects the targeted organization’s CSR disclosure speed. We also examine whether the effect of boycotts on CSR disclosure speed may vary depending on the magnitude of the potential loss resulting from failing to act or from reacting too slowly in response to such boycotts. We find that boycotts positively affect CSR disclosure speed and that this relationship is moderated by the business environment. Taken together, this study reveals CSR disclosure as a risk-reduction mechanism against boycotts. This work was supported by Korea University Business School Research Grant as well as by National Research Foundation of Korea (NRF) Grant funded by the Korean Government (NRF-2018-Global Ph.D. Fellowship Program). Carrots & Sticks Report. (2016). Global trends in sustainability reporting regulation and policy 2016 edition. https://assets.kpmg.com/content/dam/kpmg/pdf/2016/05/carrots-and-sticks-may-2016.pdf/. Fortune 2018, World’s Most Admired Companies. http://fortune.com/worlds-most-admired-companies/. International Telecommunication Union. (2013). Measuring Information Society. https://www.itu.int/en/ITU/Statistics/Documents/publications/mis2013/MIS2013_without_Annex_4.pdf. Pant, G., Srinivasan, P., & Menczer, F. (2004). Crawling the web. Web dynamics: Adapting to change in content, size, topology and use (pp. 153–177). Springer. https://pdfs.semanticscholar.org/a4f4/5f3a3d7d53a40b7b2579392a5db88cc1b822.pdf/. Statista. (2016). Percentage of population using the internet in South Korea from 2000 to 2016. https://www.statista.com/statistics/255859/internet-penetration-in-south-korea/. The Korea Herald. (2018). South Korea tops internet usage in Asia. http://www.koreaherald.com/view.php?ud=20180708000249.